✔Gift Box Packing：All you get are showing in the Pic2! 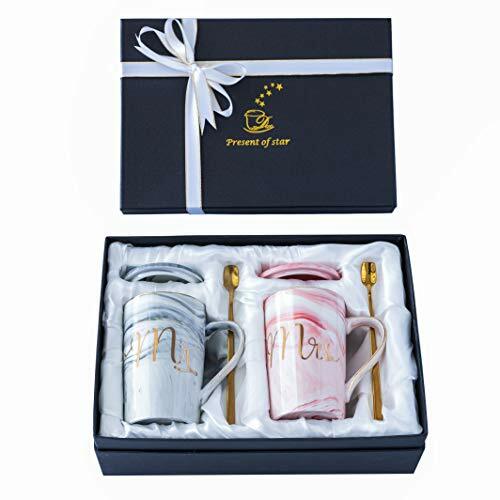 Comes in Stylish Packaging with Silk-Finished Interior. This item is ready for gift giving. 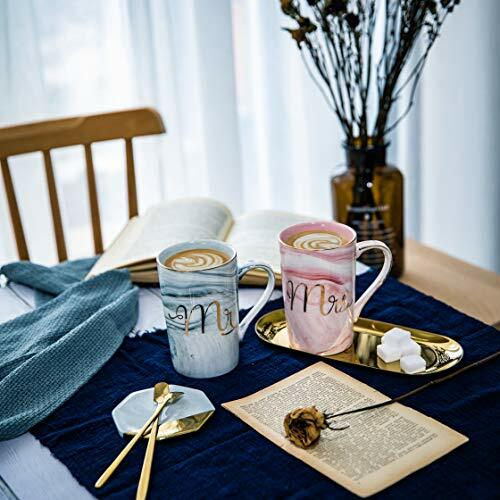 No need to repackage.1 x 14 oz Mr mug(Grey),1 x 14 oz Mrs mug(Pink)，2 x cup lid, 2 x spoons,1 x silk ribbon,1 x Pink Greeting card(You can write down your blessings to your friends）.Larger size mugs and more accessories offered,meet your further coffee drinking need or gift giving need! Top present for a Birthday, Valentines Day, Anniversary or Wedding. 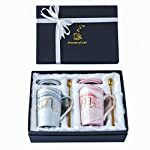 Ideal for cheap Christmas stocking stuffers, Hanukkah, xmas secret santa,holiday office party or white elephant exchange gift. 100% Ceramic material, which is Dishwasher secure but not Microwave secure. It’s an incredible gift idea anyone would like! 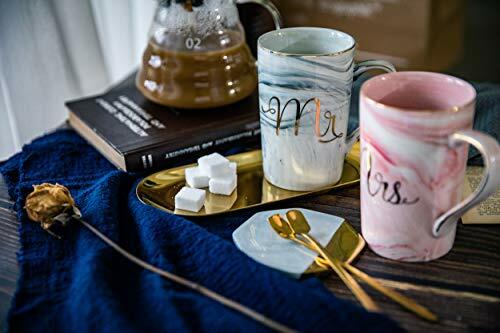 You’ll order one for yourself or as a gift for a friend or family member. We guarantee you’ll adore it – that’s why we offer you a money back warranty in case you don’t! So What Are You Waiting For? 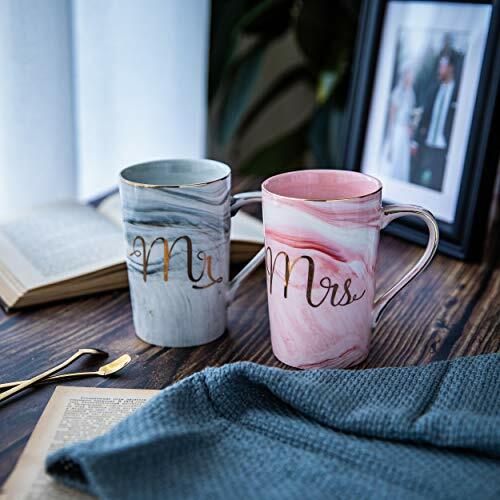 Order Your Own Mug Set – Whilst Supplies Last! ✔Gift Box Packing：All you get are showing in the Pic2! Comes in Stylish Packaging with Silk-Finished Interior. This item is ready for gift giving. 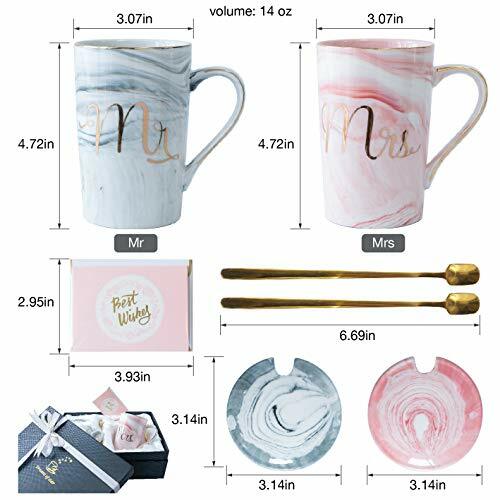 No want to repackage.1 x 14 oz Mr mug(Grey),1 x 14 oz Mrs mug(Pink)，2 x cup lid, 2 x spoons,1 x silk ribbon,1 x Pink Greeting card(You’ll write down your blessings to your friends）.Larger size mugs and more accessories offered,meet your further coffee drinking need or gift giving need! 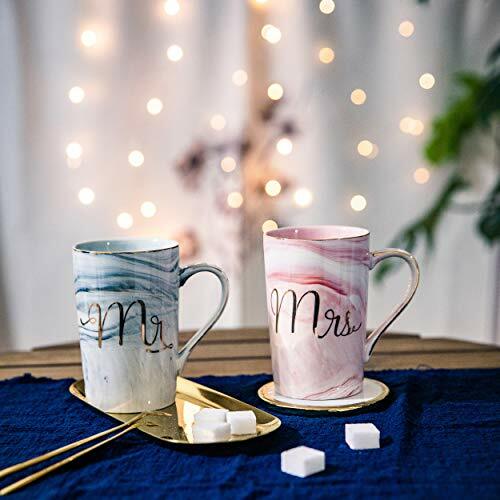 ✔Elegant Hand Made:： Each Mug’s pattern is unique，which symbolizes the unique love!Great Value, Prime quality ceramic,Gold and Marble Design ! Dishwasher secure but not Microwave secure. 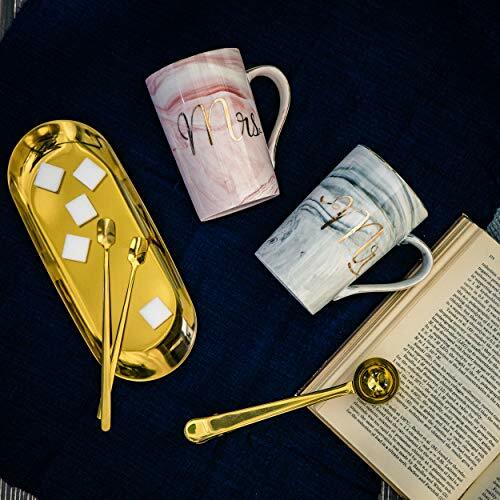 ✔Bigger size mugs：Meet your larger capacity need. ✔If they do not meet your expectations, just contact us, You’ll return it at any time, and then we can make a full refund to you .We care deeply for our customers and make you our top priority! Thank you!